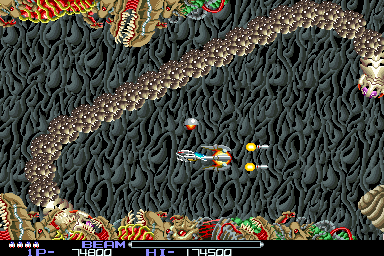 I thought I'd dedicate this blog entry to one of the most influential arcade games of my experience, R-Type. If your a classic gaming geek like me, you're bound to know that R-Type is one of the most influential coin-op scrolling shooting games of the good ol' 1980's, with Scott Ridley's Alien influenced tributes to boot! Traditional boot camp walkthrough; wiggle the joystick to move through obstacles, mash the button to shoot alien trolls, hold and let go of the button to release a machine replicated 'Kame-Hame-Ha' and try to collect power ups in hopes that you'll get a pet cyborg firefly that'll pitch in for you too. As much as it is infuriating, having to start at a set place each time you crash your fighter into either titanium or biomorphic terrain, it's definitely well worth playing for it's really 'rad' graphics for it's time and surprisingly listenable soundtrack. If all else fails though, just pretend you're on a classified space mission to have American Idol canceled. If you want to give this classic a shot, just download the MAME emulator and the R-Type rom. If you're going to go the pseudo-illegal route, that is. 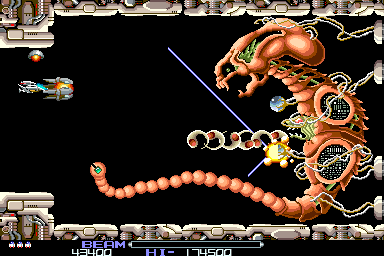 And thank Irem for R-type! Well, I'm teetering between feeling either on top of the world or so close to committing suicide, it's unbelievable!... Why? Because governments could be negotiating behind our backs whether to hand control of the entire internet to a single telecommunications conglomerate. I've no time on my blog to either explain or start a 'call to arms' against this malarkey, so I'll provide you a link to Vint Cerf's Google mini-site, so you can start from there. Moving on now, I would like to take this opportunity to highlight one of Britain's most influential manga artists, Laura Watton. 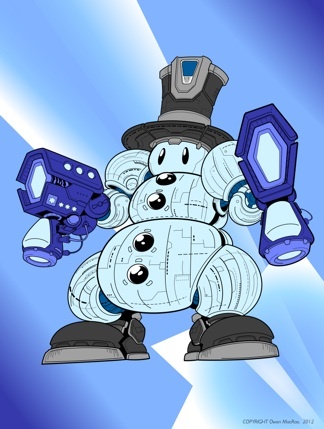 Who I got the chance to meet with at 'Thought Bubble' a few weeks ago now. Her portfolio site is at www.pinkapplejam.com. Creating manga influenced art since 1995, Laura has achieved a lot of things and has taken on several professional commissions. 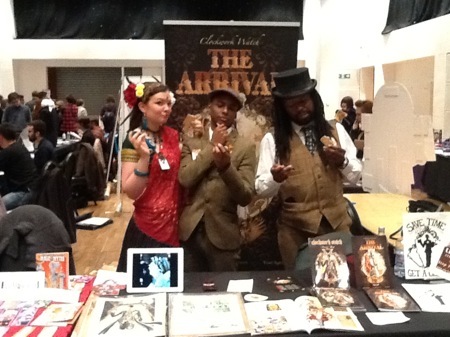 She is also very well known for being one of the founding members of the UK exclusive manga collective, Sweatdrop Studios, where she has created and published her most notable titles such as Biomecha, Reluctant Soldier Princess Nami, Squishy-Chan's Adventure and has contributed to many Sweatdrop anthologies during her course of time before moving onto self-publishing. Having been a huge Sweatdrop Studios enthusiast way back since between 2005 to 2006, I'd certainly say that the work of Laura Watton has left a strong impression on me, and really deserves a lot more attention for her unique old school yet feminine approach to her style. So do check her work out. Again, it's at: www.pinkapplejam.com. Well, Christmas is certainly coming and I'm well on track with my post grad coursework. T'is the season to... Well, panic!... If you certainly know the pre-festive experience by now, you probably wouldn't need to be reminded of all the ends that need to be met to get Christmas presents sorted, greetings cards posted and all the other hullabaloo, (on top of all the OTHER hullabaloo, depending on your view point) so's to celebrate the birth of Jesus with no possible backfire. Down to the point I thought I should share with you how my post grad website design project, which I diligently assigned for myself before the beginning of the year, is faring. As you can see by the sample mockup, which I built up from initial sketches, to crude wireframes, then to rough layouts (despite having unintentionally skipped most of the preliminary steps to 'proffesional' web design) I am just about on my way to build the site piece by piece using HTML and CSS. And at some point sooner or later, once I finally get my head round the rest of CSS, the Beep Club website you're seeing right now will probably look something like this! 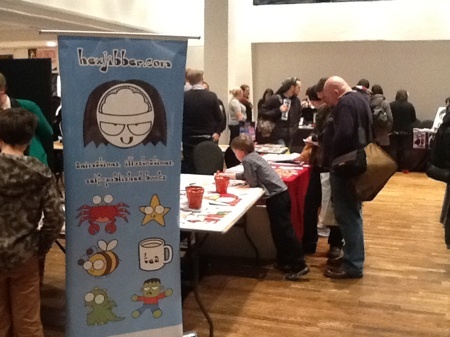 I feel guilty now that I've decided to write about Thought Bubble now rather than yesterday, the day I came back. But I guess it's better now than never, so here we go! 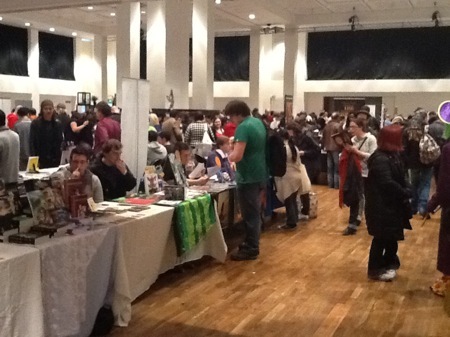 Since the last time I went to Thought Bubble last year, I knew that comic conventions like this one are great opportunities to meet new peers and catch up with the peers you already met last time. Some of those that I've come to know and love (and have also met again this year) include: Tom Siddel (Gunnerkrigg Court), Nich Angell, Destiny Blue (Yay! ), Andy (Hexjibber) Skyes, Craig Cameron (Mo-bot High) The lovely ladies at Teen Girl Comic, Jennie Gyllblad and Corey Gyllblad (Clockwork Watch) and Laura Watton! You only needed to have attend the panels and the screenings at the convention this year to agree with all that. Panels included discussion about, creative independence (in the UK especially), writing for comics, comics in the digital age, and even audience participation in the creation of a webcomic! And there was even a Judge Dredd fan film screening, Judge Minty, which I actually enjoyed even though I've never been too involved in the franchise before. And so yes! 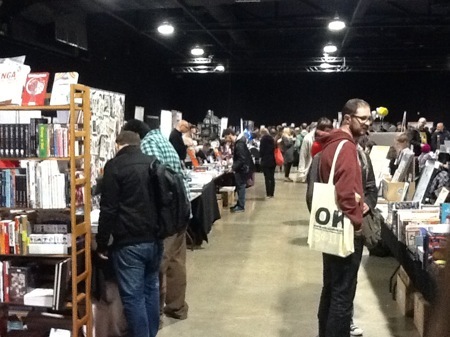 Thought Bubble 2012? Great success! I would like to thank all the people I mentioned earlier for taking the time to chat and well, just being awesome I guess. As for me, I will ultimately yell to myself "Get off ya backside and get back to work! You've earned it, dude!!" Be seeing you at Thought Bubble next year. Perhaps at my own table even.